Christmastime is here, and while it’s cool for adults (hello, wine Advent calendar), cooler for parents (watching your kid’s face as they open the perfect present? Gah. ), it’s undisputedly the coolest for kids. One way to make this holiday even more extra for your kids is by hosting a Christmas craft party. I know. I know. *Insert eye roll here* One more thing to add to your holiday to-do list. But it’s a great way for your kiddos to share the Christmas spirit with their friends, and it can be fun for you too, I promise. You don’t have to drink the crafting Kool-Aid to pull together a successful crafting party, because we’ve broken it down into three easy steps even the Grinch can follow. Think Martha Stewart is the only one who can effortlessly pull off the holiday party? Think again. Follow these three easy steps, and you’ll be the parent of the year — or at least Christmas vacation. Make the guest list with your kid and remind them less is more. This is may not be the party to invite their entire class to; a few close friends will make the party easier to manage and make the cleanup easier, and fewer kids means everything is just generally easier. Don’t make extra work for yourself. Keep things really casual by skipping snail mail invites and sticking to a festive e-vite. Quick and easy, no muss, no fuss. You won’t need to worry about decor because if you have even remotely decorated for Christmas, that’s enough. You also don’t need to come up with a music playlist; all you have to do is ask Alexa to play Christmas carols or search for “Christmas carol playlist” on YouTube and push play. Stick to one or two smaller, quick crafts or one larger, more time-consuming one. One option is to put that mountain of holiday catalogues to good use and build a giant paper-mache igloo (JK, who has the time or architectural skills for that?). An easy craft that requires zero crafting talent is a DIY Mod Podge wooden tray. Get the full tutorial from Anna, the mom behind My Life and Kids. Have the kiddos cut out the best trees, decor, bows and bells from the magazines to Mod Podge onto small wooden trays, perfect for a mug of hot chocolate and some cookies for Santa — or once the kids go to bed, a glass of wine and the good chocolates your cousin sent from England. If your kids are younger, a super-simple craft is to have them paint unfinished wooden ornaments, which you can find at any craft store this time of year for under a dollar each. Kids too old for that? Try a DIY snow globe with Mason jars from the folks at Julie Ann Art. In addition to the Mason jars, you’ll only need water, glitter and whatever you’d like to be in your snow globe (aka tiny trees or snowmen). You could also try these adorable DIY salt dough doughnut ornaments from the sister team behind A Beautiful Mess. For these look-good-enough-to-eat (but please don’t try) ornaments, you’ll need paint, water, flour, salt, clay and some paintbrushes. Voilà! Gorgeous ornaments your kids can be proud of. Having different stations for the kids to visit will keep them from overcrowding and getting glue in their hot chocolate. Because while it is tempting to minimize the mess by doing everything on one table, biting into something covered in nonedible glitter is gross. Trust me on this one. Add some true holiday spirit to your shindig with a couple of extra-festive activities. Try a classic Christmas movie, like How the Grinch Stole Christmas or A Charlie Brown Christmas. You can also have the kids decorate some Christmas cookies. Hand them a couple of bags of frosting, add some sprinkles, and you’re set. Bonus: Not only are you giving your kid and their friends a good time, but you’re also giving the parents of those kids (except you) a much-needed kid-free break from the utter chaos of the holiday season. Make sure you have bags for the kids to take their creations home, and if you’re feeling really extra, you can even set out wrapping paper and ribbon for them to wrap up their craft to give to someone special. Congratulations. 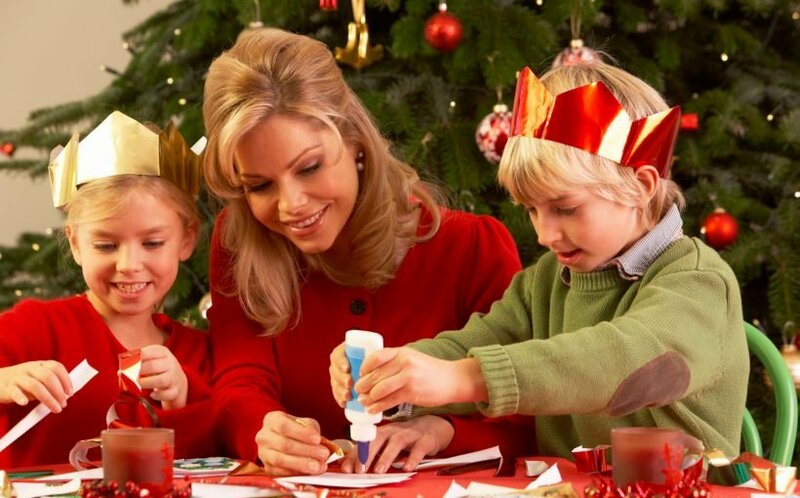 You’ve put together a Christmas craft party for your kid. Go ahead. High five yourself. We’ll wait.